Alpinestars waterproof motorcycle glove that fights windchill. Perfect for commuting or short distance touring. The ideal commuter glove: This Primer motorcycle glove from Alpinestars is perfect for riders looking for a waterproof glove that can see them through chilly autumn rides and early spring mornings. With light back of hand insulation, the Primer will fight off windchill, whilst the long gauntlet cuff provides a bit more warmth around the wrist. 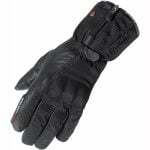 Practical features such as the touchscreen compatible fingertips and the handy visor wiper make these gloves awesome value for money.